I think The Killers need little introduction as a band. Around for almost a decade, the band is one of the most consistent producers of modern rock songs you will find, and have become wildly popular. They haven’t been afraid to change their sound slightly though, with the more electronic Day & Age and the more traditional rock sound of Battle Born being different to the more “alternative” tone of their first two albums. I love The Killers, and their new compilation album is a fantastic grouping of their classic songs, more modern greats, as well as two new songs, which I’m rather fond of as well. If you have a lot of The Killers’ songs in your library already, you’d be forgiven for missing this one out. If you’re new to The Killers, or have not followed them much since their heyday debut of Hot Fuss, then you should make this album a priority. 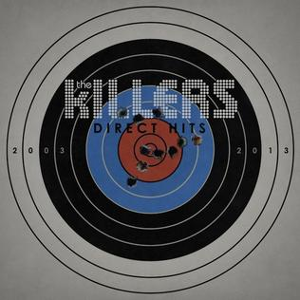 The album is arranged in a chronological order, with four Hot Fuss songs kicking off with “Mr Brightside”, followed by three songs from each of The Killers’ last three albums. Almost all of the songs they have released as singles from these albums make it, with the exception of “Bones” and “The World We Live In”, which aren’t notable by their absence. It’s a credit to the album that it showcases the change in style of the band, whilst showing that they have remained consistently great through the years. “Mr Brightside” still aches of teenage angst in the same way it did ten years ago, “All These Things That I’ve Done” is still as anthemic and “Human” is still so emotional and laden with synth. If I was to create an album with all of my favourite Killers songs, it would look like this, although I’d perhaps have included “Jenny Was a Friend of Mine” at the start as well, as it’s perhaps the best album opener The Killers have ever produced. There are two new songs tagged on at the end of the album that are just as good as what has gone before. The first, “Shot at the Night”, has an obvious M83 eighties-style influence coming from Anthony Gonzalez, but keeps The Killers’ ballad-style of pop rock. It’s a fantastic song, with a dramatic chorus which heavily invokes the feeling of Steve Winwood’s classic: “Higher Love”. The other new tune is “Just Another Girl“, which sounds like a more upbeat version of the style of song found on Battle Born, which is definitely a good thing. Whether symbolic or not, it’s interesting that The Killers close what is their “Greatest Hits so far” album with a song about moving on from a former love. All in all, Direct Hits is a compilation album well worth listening to. Fans of The Killers will rejoice that there is some new material in a year that is, hopefully, between full album releases and those that are new to the band can delight in having a definitive “Best Of” to discover the band with.